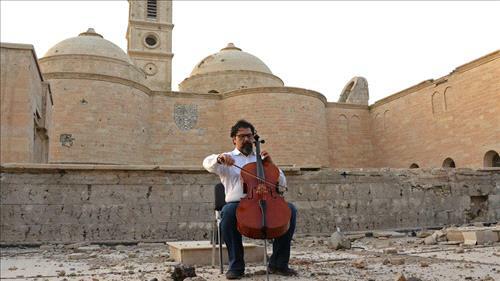 AMMONNEWS - Iraqi cellist and conductor Karim Wasfi has played a concert for “peace and co-existence” amid the ruins of Mosul, almost a year after Iraqi forces ousted ISIS from the capital of its self-declared “caliphate”. Dozens of people attended on Friday as Wasfi, in full concert dress, played on a makeshift stage among the most iconic religious monuments of Iraq’s second city. The venue lay between the Catholic church of Our Lady of the Hour with its famed clock tower and the remains of the iconic Hadba “hunchback” leaning minaret next to the Nuri Mosque, destroyed during the battle for the city. “This music is a message from Mosul to the whole world, of the concepts of security, peace and coexistence,” said Wasfi. The dual Iraqi-US national is former conductor of Iraq’s National Symphony Orchestra and has been nicknamed “Iraq’s Rostropovich” after the Russian maestro cellist. The music was “a call for companies, investors and organizations to come and take part in the reconstruction of the city, especially its destroyed Old Town”, the bearded and bespectacled artist said.